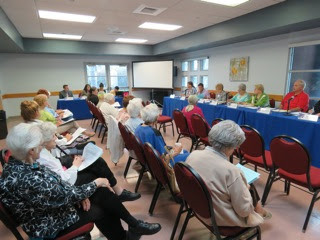 The Costa Mesa Senior Commission met this morning again and all members were present for the first time. Unfortunately, it's playing to a diminishing crowd with each meeting. Today there were eighteen of us in the "crowd" - seventeen ladies and me. Pretty good odds, don't you think? I wrote earlier about the agenda, HERE. If you go there you can follow along with the progress of the meeting. There are staff reports for each item except the Senior Center Administrator's Report. So, there will be seven (7) selections available on the ballot next month. Next came Old Business 6b, the Albert Dixon Funds issue. Recreation Manager Travis Karlen read the letter from the Albert Dixon Foundation president, Mike Scheafer, which formed part of the agenda packet, which clearly outlined the plan to dissolve the foundation soon and that they, the foundation board, is actively interviewing possible recipients of funds from that organization. Sue Healy asked about the "wish list" previously created and wondered about that status. Karlen told the commission that the information had been provided to the Albert Dixon Board and that he, Karlen, was interested in any other thoughts the commissioners might have. He also mentioned that the dissolution process will not be a quick process - it would be a matter of months, not weeks. Correspondence from the President of that foundation, Mike Scheafer, makes it clear that his board has no plans to provide any of the funds directly to the Senior Center for any purpose, but is diligently moving forward to find worthy senior-oriented organizations/activities to which it can contribute funds before dissolving the foundation. She implied that I somehow had insider information on how the Albert Dixon Foundation Board plans to distribute the more than $600,000 presently in the coffers. Of course, my information was taken directly from Scheafer's letter. Mention was made about the foundation possibly just giving the funds to the Costa Mesa Foundation for distribution. It's my impression, following a subsequent conversation with Scheafer, that such an action is not their first choice. The Albert Dixon Foundation Board prefers to have a more direct choice on where those funds go. It's interesting to note that Feeney DID NOT solicit public comments on this issue - perhaps the most sensitive item on the agenda. And, although I was sitting right there, she chose NOT to ask me about what I had written. She just moved on to the next agenda item. The staff needs to remind her of the need to solicit public comments during the meetings. The next item, New Business 7a, the Instructional Class Proposal, generated more discussion than I expected. John McGlinn was concerned about the costs, the creation of which was explained by Karlen. He also explained that the Parks and Recreation Commission was requesting an evaluation of all fees, including those for the Senior Center. Concerns were expressed by commissioners about the duration of some of the computer classes - 3 hours - citing problems some seniors may have with that duration. 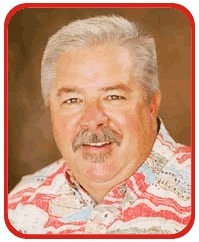 Feeney said, "I don't know about the rest of you, but I have a really weird bladder. It just wants to do it's own thing." Others also shared her concern for the ability of seniors to focus on a complex subject for three hours at a shot. As an aside, this meeting lasted nearly two and half hours and only one member of the audience left for a bathroom break, although a couple did doze off from time to time. Questions were raised about perhaps breaking the class times into smaller bites - one hour, for example. Staff will investigate that possibility. Also, staff was asked to investigate the possibility of scholarships for seniors, since some of the costs seemed out of reach of many. When asked about expanding the class size - a maximum of 6 is presently the limit - we were told there are only 6 computers available. The commission voted, 7-0, to accept the new schedule and prices. Next came New Business #7b, the Bus Study, HERE. Senior Center Program Administrator Yvette Aguilar presented a PowerPoint program which graphically showed that those who participated in a recent survey of bus riders were overwhelmingly satisfied with the service as provided. Following the presentation Feeney dominated the discussion, which included concerns about the scheduling of the bus and concerns about how the bus driver spends her time when she's not out picking up riders. Several times during the discussion the driver, Elaine, was praised for her diligence and demeanor. There were also concerns expressed about the two buses presently in service. The larger, 16-passenger bus, has 300,000 miles on it so the driver is reluctant to use it from a reliability standpoint. The other bus, a 12-passenger unit, has "only" 200,000 miles on it, but it apparently is the primary unit used on a daily basis. 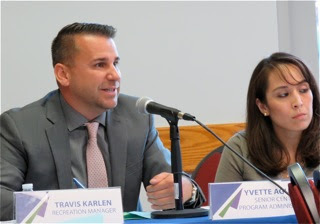 When asked about a new bus, Karlen indicated that the fleet is on an established replacement schedule, and that he didn't know where these two buses fell on that schedule, but would inquire. It was interesting that Feeney, instead of simply directing staff to assess the situation and bring back alternatives, tried to micro-manage the issue. She read a segment from the staff report that defines the mission of the commission, which she apparently has interpreted to mean that she's supposed to create solutions instead of directing staff to offer alternatives based on their professional assessment. She emphatically stated several times that the schedule needs to be tightened up - whatever that means. There was a short discussion about hiring (or using volunteers) to act as a dispatcher for the bus. Apparently other organizations operate that way. Member Kirk Bauermeister observed that there is a limited pile of money available and mentioned that in his business (education) they operate with a philosophy of, "You can do anything you want to do, but you can't always do everything you want." The situation needs to be evaluated and choices made. Several people spoke on this issue. It was hard to keep track because Feeney kept interrupting them before their three minutes had expired. She needs to "tighten up" her management of the meetings. 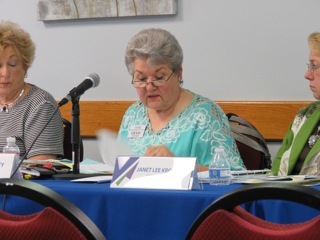 During the Senior Center Program Administrator's Report, Aguilar addressed recent past events, then mentioned upcoming events - the Luau on August 14; Volunteer Training on August 21; Volunteer Appreciation Dinner on August 28 and the as-yet-unscheduled Grandparents Casino Night Out. During this segment concern was expressed by at least one audience member about being unable to attend events because of scheduling conflicts. Karlen observed that as the programming at the Senior Center grows those kind of conflicts are going to happen - that folks will simply have to make a choice. The recruitment for members of the Senior Advisory Committee (SAC) has been extended until July 31 because only 3 applications had been received. Membership as of July 1 is up to 1,538 members, of which 1,050 are Costa Mesa residents. Volunteer hours in May and June totaled 842.75 service hours. Programmed Hours totaled 903.75 in May and 775 in June. There were a total of 5,914 "visitors" to the Senior Center during May and 5,677 in June. That "visitor" number includes duplicated numbers, where each member is counted for each activity attended. This led to a discussion of how we keep track of folks at the Senior Center. It was suggested by Member Janet Krochman that some kind of "loyalty card" - similar to those used at markets - might be used and activity tracked using a Cloud-based data base. Each member would have a card which would be scanned or swiped for entry into the building and for each activity. It seems like an idea worth investigating. During member comments member Anne Perry expressed an interest in staff, and possibly members, being trained on Automatic Defibrillator Devices. She also suggested that perhaps shorter day trips might be considered to venues closer to home - the Segerstrom Center for the Arts, Laguna Beach Arts Festival, etc., to supplement the longer Vegas trips. Bauermeister thanked the staff for their excellent reports and support. WEB SITE ISSUES - FRAUD? Stella Adkins expressed concern about the Senior Center web page, HERE. Apparently members of the staff under the old regime - The Costa Mesa Senior Center Board - have not only refused to turn the website over to The City, but have actually renewed their management arrangement with the service provider. This is seriously problematic, since there appears to still be an active PayPal account with which solicited funds could be accumulated. Karlen told me that this is in the hands of the City legal department. It seems likely that fraud is possible with this site. If former staffers are withholding this site from The City through vindictiveness, that's one issue. However, if they are misusing it to gather funds, that's an entirely different and much more serious matter. Member McGlinn stood up and, once again, reiterated his opinion that the Senior Commission needs a strategic plan - a road map to follow moving forward. So far, his idea seems to have fallen on deaf ears. Member Sue Healy introduced herself, spoke about her 29 years with the school district and her volunteer work at the Senior Center for the past couple years. She expressed the view that there are not enough seating areas on the first floor of the Center. She suggested that the staff look into that issue. Feeney waived a folded packet of papers around indicating that she'd received a petition from member Edwina Worsham signed by 36 members and that she would talk to Assistant CEO Tammy Letourneau when she returned from medical leave. She didn't say what it was about, so I asked... seems it also involved furniture. She also expressed the need for wheelchairs for the Center, citing that there had been many under the old regime that had been donated, including a yellow one used for emergencies. She also said they needed to have a Fire Drill ASAP, since there had not been one for a year and a half. 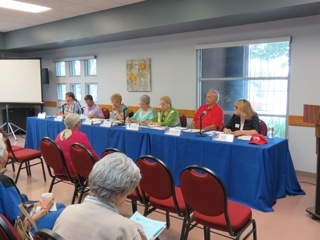 She also expressed the need for a Community Survey of seniors to determine what they want from a Senior Center. She said the prior regime refused to do one. An observation... The Senior Commission is made up of some good folks, with lots to offer the seniors of this community. They are still getting their "sea legs", and will likely be an effective unit as the months pass. It seems to me that meeting every other month is not frequently enough to maintain momentum on important issues. Also, Chairwoman Feeney needs some guidance on her role. She acts as though someone anointed her queen, instead of the chair of the commission. She needs to understand that there's a difference between a discussion and demands. She needs to permit speakers their full three minutes without interruption. Presently she turns the speaker time into a chat session, taking a page out of Mayor Pro Tem Jim Righeimer's playbook. I don't think it's malicious on her part, but she needs to "tighten up" her game. She needs to run the meeting following the rules established, not like a coffee klatch. She needs to help her fellow commissioners arrive at the direction they want to give staff, not just unilaterally demand from the staff certain actions.